Opinions and advisories on the techno-turnpike, ostriches in Aroostook, and salmon in the schools. Longer than the Maine Turnpike, the legendary logging road that cuts through the North Woods has opened the wilderness to everyone with a car — and turned a giant paper company into a reluctant park service. By Jeff Clark. Lois Dodd’s well-ordered paintings are filled with intriguing reflections and simple patterns, much like the life she has hammered out for herself in Maine and New York. By Elizabeth Peavey. The most rockin’ place on Great Chebeague Island is the front porch of the Chebeague Inn. By Andrew Vietze. An enterprising couple in North Yarmouth is capitalizing on the vogue in hardy antique roses. By Joanne Johnson. For an ambassador to Norway, it made perfect sense to erect an authentic Norwegian hytte as a summerhouse on a rugged Maine island. By Ellen MacDonald Ward. Knighted by Queen Victoria, Hiram Maxim, from Sangerville, Maine, invented the machine gun that helped Britain subdue an empire. By James P. Brown. You can’t drive by this gleaming white church without slowing down to marvel at it. Been there? Three more unusual success stories from the Pine Tree State, each with a musical twist. In one of the most anonymous villages on the island sits a world-class collection of luxury automobiles. In the heat of a summer night in 1907, one false move changed Old Orchard Beach forever. By Ellen MacDonald Ward. A few years ago, I read in a newspaper that the state of South Carolina was going to install a new electric chair because the old one was considered unsafe. By Caskie Stinnett. 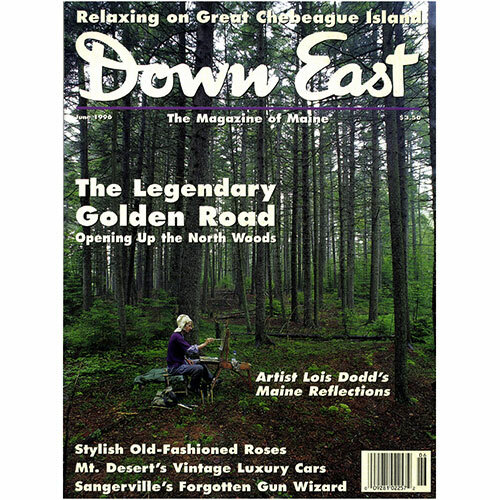 Cover: Artist Lois Dodd at work in the woods near her home in Cushing. By Benjamin Magro.